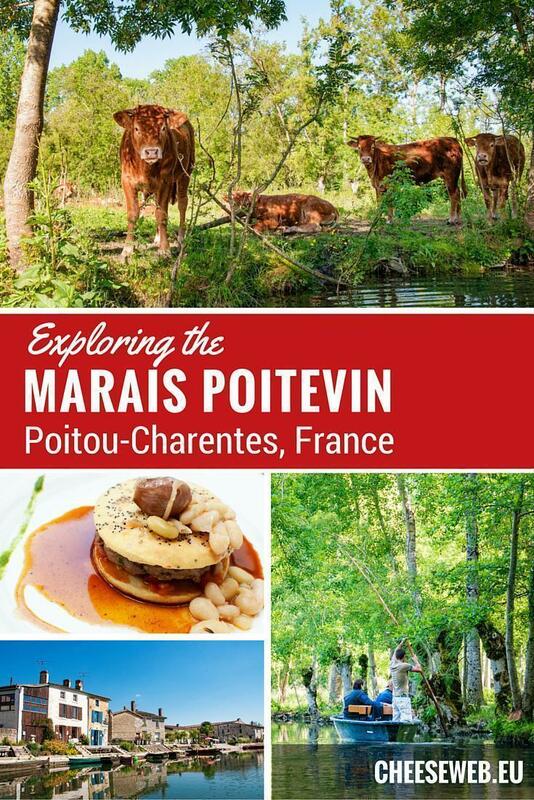 While most people know the region, Poitou-Charentes, for its stunning Atlantic coast, there is another important wetland here, the Marais Poitevin, or Poitou’s Marsh. The warm morning sun dances on the river, in Coulon, France. 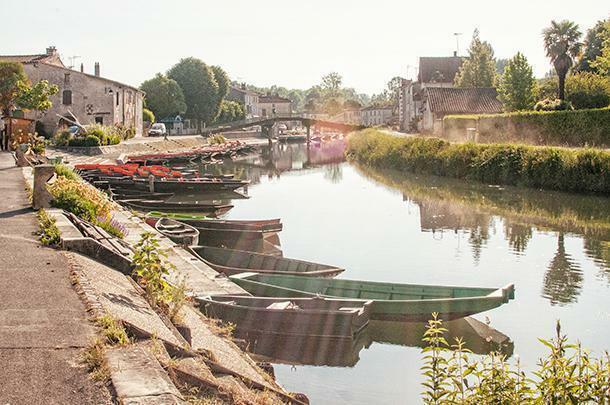 As the sun rose one morning in early May, we found ourselves at the edge of the water in the lovely village of Coulon, France. The spring sun warmed us as we stood on the pier marvelling at the luscious green vegetation and small boats clustering along the shore of the river Sèvre Niortaise. Nothing moved on shore but the water was alive with fish, birds, and insects. It was the perfect spot to sip a cup of coffee and contemplate the day. 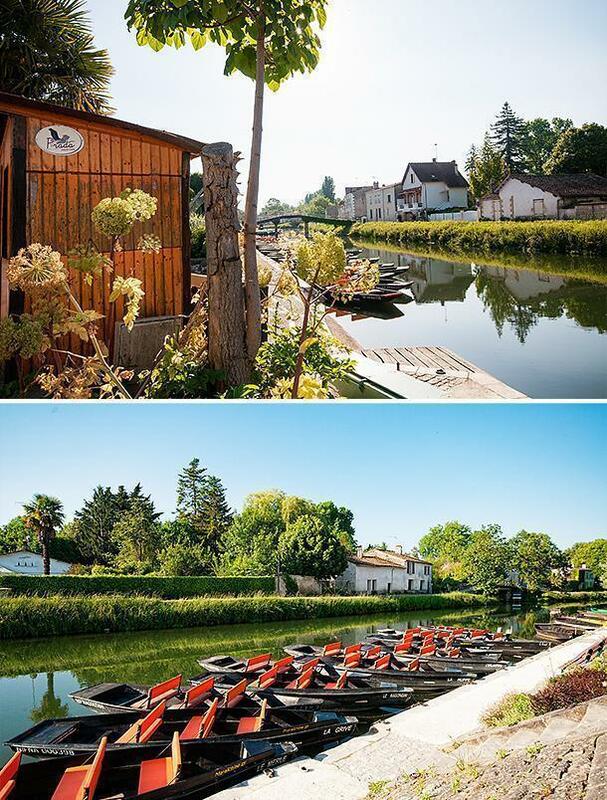 But we were here to explore the Marais Poitevin, France’s second largest marsh and the biggest on the Atlantic Coast. The marsh’s 970 square kilometres are made up of dry and wet areas on both sides of the Sèvre Niortaise River. The dry areas are where farmers raise cows or plant crops. The wet marsh, about a third of the total marsh, is a maze of pretty canals covered in duckweed and bounded by trees and bushes. Coulon is the gateway to this ‘Green Venice’ and the site from which most boat tours enter the marsh. 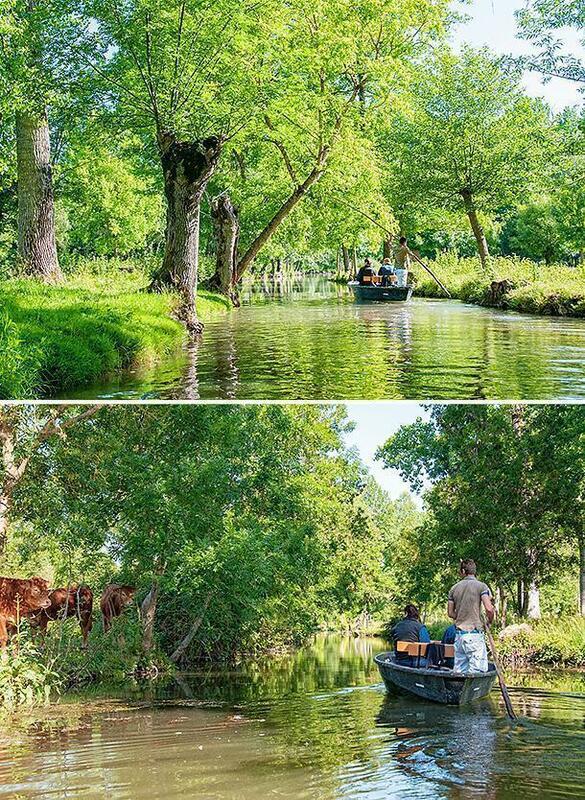 Due to the fragile ecosystem, tour companies on the marsh use small, traditional barques powered by poles or paddle. There are no mega-tour boats with loudspeakers on this waterway! Time for a boat tour with Embarcadère Prada, Coulon. Our pilot and guide, Guillaume, is a paysagist, a naturalist starting his first season as a guide with Embarcadère Prada. To begin, he uses a long wooden paddle to propel us through the water, but he will eventually graduate to a pigouille, a long pole used to push off the bottom. Boats are propelled using long paddles or even longer pigouilles (above). Marsh tours typically start at 10 am but, due to our packed schedule, we were granted an early trip, leaving us virtually alone on the water. It was deliciously quiet, the sun’s light filtering through the green leaves of the trees, and the water was disturbed only by our passage. 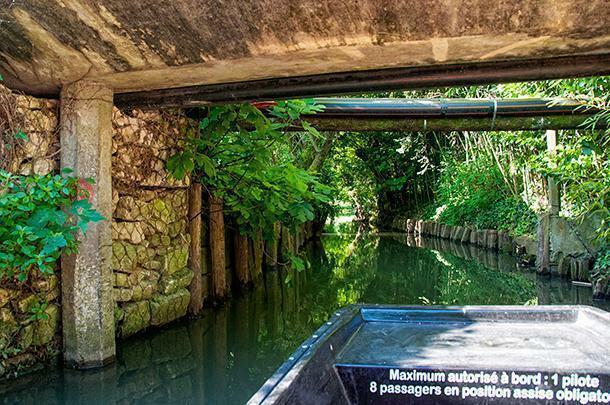 Watch your head, low bridges keep big boats out of the Marais Poitevin. Deliciously green and quiet…although later in the season it will be much busier! Guillaume told us the marsh has over 1200km of waterways, classed into three tiers: the first tier is for larger boats in both directions; the second tier for large boats in one direction; and the third tier is for small boats only. All boats are flat bottomed and follow a traditional style with a wide bow for landing against canal banks and a narrow stern for better control. We spent 90 minutes meandering through numerous third tier (and smaller) canals, learning about the plants, the animals, how farmers move cows from island to island and how the marsh has evolved. Guillaume also demonstrated just how prevalent methane is in the marsh by lighting the surface of the water on fire! Some of the marais residents are more interested in us than others. Water on fire?! That’s a sight to see. It was a beautiful morning travelling on picturesque canals with someone who is truly passionate about the landscape. Don’t take my word for it, check out the video. Sadly, our tour of the marsh came to an end and Guillaume dropped us back in Coulon. After thanking Guillaume and saying goodbye, we walked from the pier to the marsh museum housed in the old customs house. 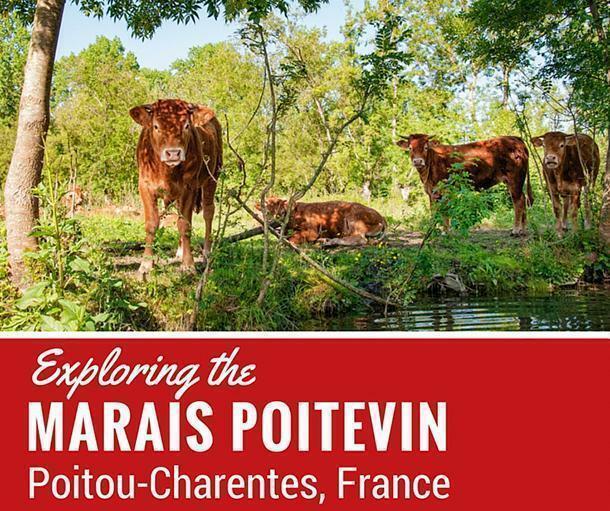 The House of the Marais Poitevin is a great place to get a better understanding of the marsh’s development and importance. The Maision du Marais gives an overview of life on the marshes. Our visit started with a 15-minute video explaining the evolution of the marshes, from the monks through to modern day. The marsh was originally drained by monks, to create agricultural land and to reduce flooding. Those works were expanded, over the centuries, and larger canals were created to channel the water to the river and from there to the sea. If you look on Google Maps today, you will see just how extensively this marsh has been sculpted by humans. The curators of the museum have done a good job building a tour that complements a visit to the marsh. The museum’s displays provide background into the history of the marsh, the traditions, the types of boats, and the people living on the marsh. 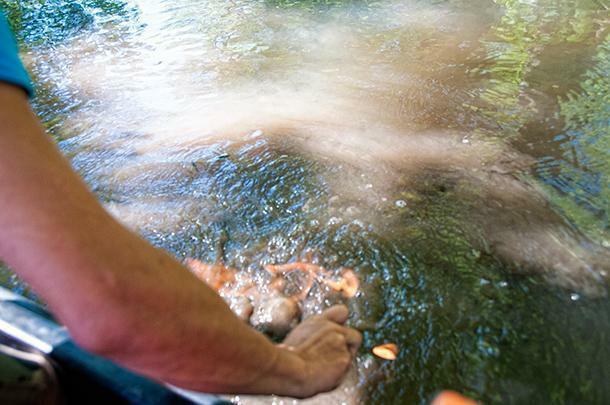 It also informed us about the animals and plants native to the area. We suggest visiting the museum ahead of a marsh tour to have a good foundation, so you can really profit from the expertise of your guide. As we exited the museum we were starving, but just around the corner, a lunch of local products awaited us. We entered the Hotel and Restaurant Le Central and were led to a shady table on the enclosed terrace. The day had turned into a scorcher and it was a relief to escape the hot sun. Guillaume had encouraged us to try one of the products grown in the Marais Poitevin, mogettes, a smooth white bean favoured in these parts. When we spotted them paired with Foie Gras in one of the first courses, neither of us could resist. In fact, the bean soup was so good, both of us declared it didn’t even need the addition of the foie… not that we’d ever turn down good foie. 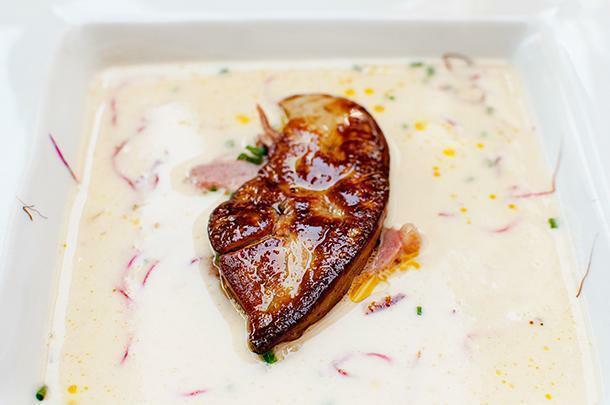 Foie gras and mogette soup at Le Central, Coulon. 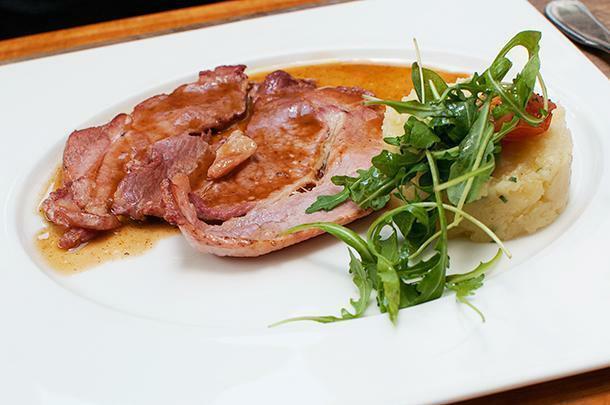 For our main courses, we were divided. Unsurprisingly, Andrew opted for the local pork, again paired with mogettes. Local pork and more mogettes. I chose lamb, mixed with local herbs, and served on a bun burger-style. It was also topped with mogettes and a confit tomato sauce. The flavours were incredible. 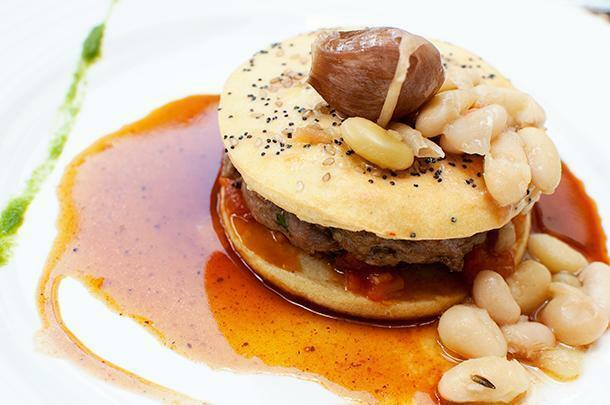 An haute cuisine lamb burger. For dessert, Andrew treated himself to a strawberry confection, accented with Angelique, Angelica or wild celery, another local delicacy. I opted for what would be both the strangest, yet tastiest dessert I had experienced in a long time. When in arrived, topped with rocket, my dessert looked like a salad. 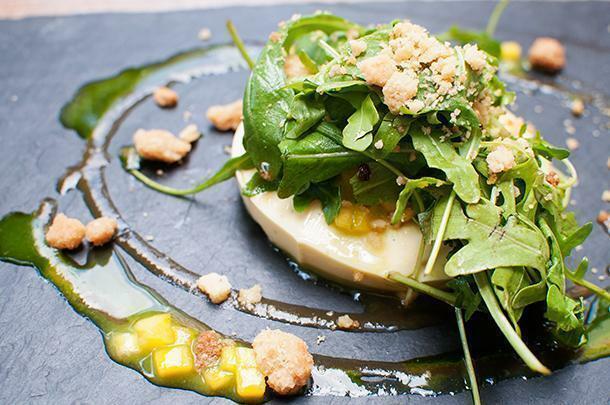 However the pepper twang of the rocket was paired with sweet mango, tart lemon crème brûlée, and a crunchy crumble. It was inventive, original, and definitely delicious. 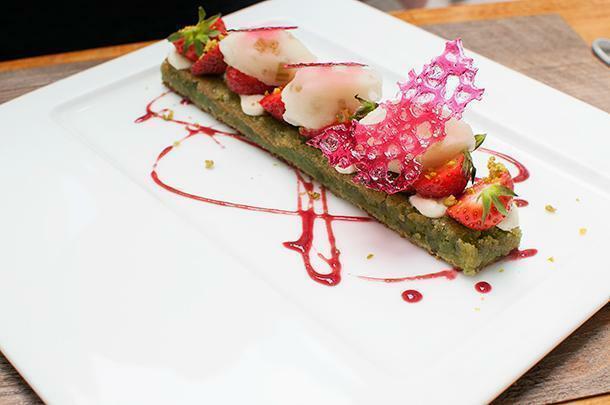 Unique and delicious; my dessert at Le Central. 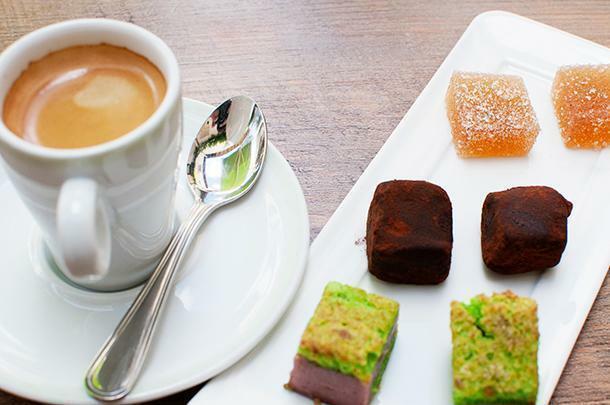 Even the coffee and nibbles were perfect. Speaking with Chef Jean-Paul Guenanten, after our meal, we could hear his passion for the local produce. With treasures from the sea and the land so readily available, Coulon is blessed with the very best Poitou-Charentes has to offer. We’d like to thank Jean-Paul Guenanten for his warm welcome at Le Central and Guillaume from Embarcadère Prada for the excellent tour of the Marais Poitevin. Thank you also to the Région Poitou-Charentes Tourism office for hosting us in the area. As always, all opinions are our own.